David Maxwell-Jolly (cohort ’77) received the second biennial Alumni Leadership Award on Friday, June 20, 2014, at the Commencement Weekend Celebratory Dinner. Maxwell-Jolly has led an extraordinary career in government service, working on a variety of health-care issues, and implementing and directing radical changes to a number of California’s health care and child support systems. Most recently, Maxwell-Jolly was appointed the Chief Deputy Executive Director of the California Health Exchange, California’s successful response to the implementation of the Affordable Care Act. Maxwell-Jolly’s work on this front resulted in one of the nation’s most successful healthcare exchange portals, and an example for other states. His significant contributions to the betterment of California demonstrate a deep knowledge and passion for policy, and we are thrilled that he will be receiving this award. He is a truly exemplary ambassador for the Pardee RAND Graduate School and its mission to be the answer. 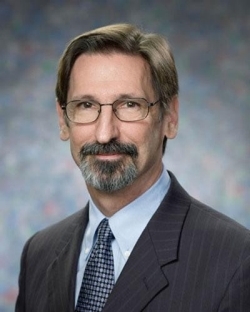 David Maxwell-Jolly recently retired as Chief Deputy Executive Director, Strategy at Covered California, where he oversaw the management, program development, and implementation of California’s health benefit exchange. His departure from Covered California marked the end of a 31-year career with the State of California during which Maxwell-Jolly held a series of senior executive positions. These include Undersecretary and Deputy Secretary at the Health and Human Services Agency, Director of the Department of Health Care Services, Chief Deputy and Director of the Department of Child Support Services, and Director of the California Child Support Automated System at the Franchise Tax Board. In his executive positions he made significant contributions to the advancement of health reform and coverage expansion; initiated a significant expansion in the use of managed care in the Medi-Cal program, including the authorization of demonstration programs for beneficiaries enrolled in both Medi-Cal and Medicare; and worked to enhance the ability for California to control Medi-Cal costs. He directed the management and successful launch of several large-scale information technology projects, including the single statewide child support system and the Covered California enrollment portal. He served as fiscal staff for the California Legislature for 17 years at the Legislative Analyst’s Office and the Senate Appropriations Committee. He earned a doctorate and master's degree in public policy analysis from the Frederick S. Pardee RAND Graduate School, a master's degree in public health from the University of Michigan, and a bachelor's degree in history and political science from Indiana University.